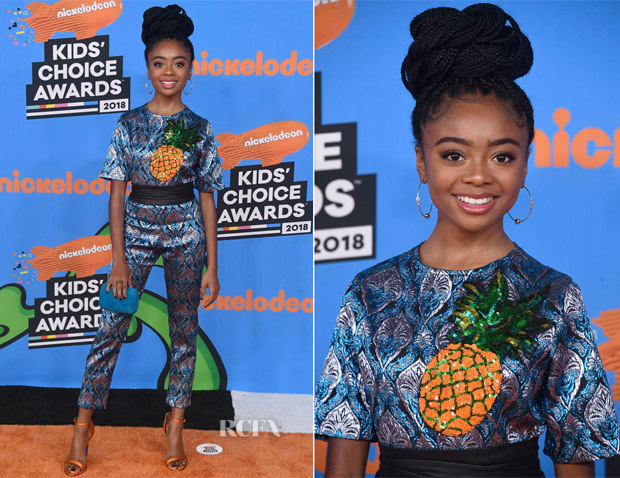 Skai Jackson was also in attendance at the Nickelodeon 2018 Kids’ Choice Awards on Saturday (March 24) in Inglewood, California. The young star deftly balances both sophistication with youthfulness, and I think she accomplished that again with this Alcoolique Resort 2018 design from the Italian label known for its lush textiles. The embellished pineapple was the tipping point of the look that introduced just the right amount of cool-girl zing to the patterned jumpsuit. I like how her updo and pineapple-orange Loriblu sandals tied it all together.